With the World Cup on and my team about the hit the pitch against Brazil in a few minutes I wanted to give this month's preserves a little Portuguese nod. I wanted to make something that we could use as a dessert topping and in a cocktail. As the summer heats up I will be pulling out our Ice Cream maker and one of these will be the final topping on a tasty homemade sundae. I'm also really looking forward to using one of these in a Manhattan instead of one of those nasty nuclear red jarred supermarket Maraschino cherries. Where I adapted this recipe was in the alcohol I used. Aguardente is popular Portuguese brandy that is made by using the spent grape must after wine making, very similar to an Italian grappa. I also added a touch of Amaretto to add an hint of almond flavor. 1 - In a saucepan, over medium heat combine sugar and water. Bring to a boil, stirring to dissolve sugar. Add the cherries, stirring constantly, and return to a boil. Reduce heat and boil gently for 5 minutes. 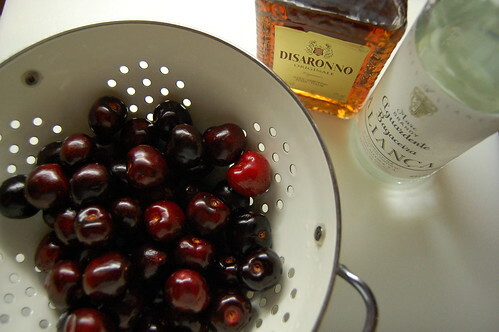 2 - Using a slotted spoon, pack cherries into prepared hot jars to within about 1/2" of top of jar and add the Aguardente and Amaretto. Ladle hot syrup into the jars to cover the cherries leaving 1/2" of headspace. Remove any air bubbles, adding more syrup if needed. Seal with prepared lids and hot water process for 15 minutes. Nice, nice job. I love the addition of the Amaretto as cherries and almonds love each other so. I've been reading maraschino cherry recipes and some are rather involved. This is super quick and easy and probably just as good sitting in the bottom of a Manhattan! The results so far are awesome, 2 for the price of 1. Tasty sour cherry infused vinegar and some sweet and sour cherries that are excellent in the bottom of a Manhattan.